Waterskiing and wakeboarding are at the center of our waterfront program. These are consistently amongst our most popular camp activities and it is easy to see why. Our experienced instructors take the time to work with our youngest campers, helping them get up on two skis. As campers improve they learn various tricks: how to drop a ski, how to dock start and how to slalom. Our Malibu Response, Malibu Wakesetter and Mastercraft are top notch boats and are ideal for pulling our campers. 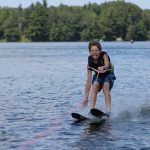 We have a variety of waterskis that meet the needs of all of our campers. Beginners have several wider skis that help them get out of the water and learn balance. More experienced campers can choose from our slalom skis. 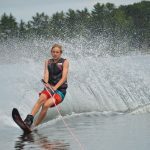 When campers go down to our ski area, they also have the opportunity to wakeboard, wakeskate or kneeboard. 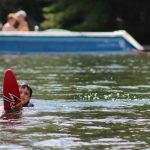 We also have tubing on cabin cruiser days, one of the real highlights of the summer! A new addition for waterskiing and wakeboarding has been our cable system. 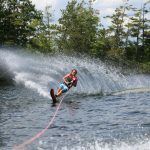 This allows our beginner skiiers and wakeboarders to literally get their feet wet as they have their first experiences in the water. Before being pulled by our boats, campers are able to get comfortable in the water with an instructor at their side.